Another reason for scientists to expect life on Mars had to do with the apparent seasonal color changes on the planet's surface. This phenomenon led to speculation that conditions might support a bloom of Martian vegetation during the warmer months and cause plant life to become dormant during colder periods. Animation of the Olympus Mons Caldera. Unlike the features shown in the above two images, many systems on Mars do not show evidence of catastrophic flooding. Instead, they show a resemblance to drainage systems on Earth, where water acts at slow rates over long periods of time. As on Earth, the channels shown here merge together to form larger channels. Phobos (IPA /ˈfoʊbəs/, Greek Φόβος: "Fright"), is the larger and innermost of Mars' two moons, and is named after Phobos, son of Ares (Mars) from Greek Mythology. Phobos orbits closer to a major planet than any other moon in the solar system, less than 6000 km above the surface of Mars, and is also one of the smallest known moons in the solar system. 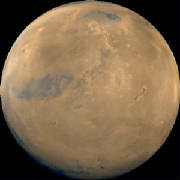 Its systematic designation is Mars I. The adjectival form of the name is Phobian, and in fairly common usage. Phobos was discovered by American astronomer Asaph Hall on August 18, 1877 at the US Naval Observatory in Washington, D.C at about 09:14 GMT (contemporary sources, using the pre-1925 astronomical convention that began the day at noon, give the time of discovery as August 17 16:06 Washington mean time). . Asaph Hall also discovered Deimos, Mars' other moon. "I repeated the examination in the early part of the night of [August] 11th, and again found nothing, but trying again some hours later I found a faint object on the following side and a little north of the planet. I had barely time to secure an observation of its position when fog from the River stopped the work. This was at half past two o'clock on the night of the 11th. Cloudy weather intervened for several days. "On 15 August the weather looking more promising, I slept at the Observatory. The sky cleared off with a thunderstorm at 11 o'clock and the search was resumed. The atmosphere however was in a very bad condition and Mars was so blazing and unsteady that nothing could be seen of the object, which we now know was at that time so near the planet as to be invisible. "On August 16 the object was found again on the following side of the planet, and the observations of that night showed that it was moving with the planet, and if a satellite, was near one of its elongations. Until this time I had said nothing to anyone at the Observatory of my search for a satellite of Mars, but on leaving the observatory after these observations of the 16th, at about three o'clock in the morning, I told my assistant, George Anderson, to whom I had shown the object, that I thought I had discovered a satellite of Mars. I told him also to keep quiet as I did not wish anything said until the matter was beyond doubt. He said nothing, but the thing was too good to keep and I let it out myself. On 17 August between one and two o'clock, while I was reducing my observations, Professor Newcomb came into my room to eat his lunch and I showed him my measures of the faint object near Mars which proved that it was moving with the planet. "On August 17 while waiting and watching for the outer moon, the inner one was discovered. The observations of the 17th and 18th put beyond doubt the character of these objects and the discovery was publicly announced by Admiral Rodgers." The names were suggested by Henry Madan (1838–1901), Science Master of Eton, from Book XV of the Iliad, where Ares summons Fear and Fright. Phobos was photographed close-up by Mariner 9 in 1971, Viking 1 in 1977, Phobos 2 in 1988, Mars Global Surveyor in 1998 and 2003, and by Mars Express in 2004 . Phobos orbits Mars below the synchronous orbit radius, meaning that it moves around Mars faster than Mars itself rotates. Therefore it rises in the west, moves comparatively rapidly across the sky (in 4 h 15 min or less) and sets in the east, approximately twice a day (every 11 h 6 min). It is so close to the surface (in a low-inclination equatorial orbit) that it cannot be seen above the horizon from latitudes greater than 70.4°. This low orbit means that Phobos will eventually be destroyed: tidal forces are lowering its orbit, currently at the rate of about 1.8 metres per century, and in about 50 million years it will either impact the surface of Mars or (more likely) break up into a planetary ring. Given Phobos' irregular shape (intermediate between a prolate and oblate spheroid) and modeling it as a pile of rubble (specifically a Mohr-Coulomb body), it has been calculated that Phobos is stable with respect to tidal forces, but it is estimated that Phobos will pass the Roche Limit for a rubble pile of its description when its orbital radius drops to about 8400 km, and will probably break up soon afterwards . Because of its ellipsoidal shape alone, the gravity on Phobos' surface varies by about 210%; the tidal forces raised by Mars more than double this variation (to about 450%) because they compensate for a little more than half of Phobos' gravity at its sub- and anti-Mars poles. As seen from Phobos, Mars would be 6400 times larger and 2500 times brighter than the full Moon as seen from Earth, taking up a full 1/4 of the width of a celestial hemisphere. This means that Phobos would look smaller than Earth's moon as seen from the planet's surface. As seen from Mars' equator, Phobos would be one-third the angular diameter of the full Moon as seen from Earth. Observers at higher Martian latitudes (less than the 70.4° latitude of invisibility) would see a smaller angular diameter because they would be further away from Phobos. Phobos' apparent size would actually vary by up to 45% as it passed overhead, due to its proximity to Mars' surface. For an equatorial observer, for example, Phobos would be about 0.14° upon rising and swell to 0.20° by the time it reaches the zenith. By comparison, the Sun would have an apparent size of about 0.35° in the Martian sky. Phobos' phases, inasmuch as they could be observed from Mars, take 0.3191 days to run their course (Phobos' synodic period), a mere 13 seconds longer than Phobos' sidereal period. Phobos is a dark body that appears to be composed of C-type surface materials. It is similar to the C-type (blackish carbonaceous chondrite) asteroids that exist in the outer asteroid belt. Phobos's density is too low to be pure rock, however, and it is probably composed of a mixture of rock and ice. The Soviet spacecraft Phobos 2 detected a faint but steady outgassing from Phobos. Unfortunately Phobos 2 failed before it could determine the nature of the material, but it is most likely water. Recent images from Mars Global Surveyor indicates that Phobos is covered with a layer of fine dust about a metre thick, similar to the regolith on the Earth's Moon. Phobos is highly nonspherical, with dimensions of 27 × 21.6 × 18.8 km. It is heavily cratered, and the most prominent surface feature is the large crater named Stickney, after the maiden name of Asaph Hall's wife Chloe Angeline Stickney Hall. Like Mimas's crater Herschel on a smaller scale, the impact that created Stickney must have almost shattered Phobos. The grooves and streaks on the surface were probably also caused by the Stickney impact. The grooves are typically less than 30 m deep, 100 – 200 m wide, and up to 20 km in length. Phobos and Deimos both have much in common with carbonaceous (C-type) asteroids, with very similar spectra, albedo and density to those seen in C-type asteroids. This has led to speculation that both moons could have been captured into Martian orbit from the main asteroid belt. However, both moons have very circular orbits which lie almost exactly in Mars' equatorial plane, while captured moons would be expected to have eccentric orbits in random inclinations. Some evidence suggests that Mars was once surrounded by many Phobos- and Deimos-sized bodies, perhaps ejected into orbit around it by a collision with a large planetesimal . Around 1958, the distinguished Russian astrophysicist Iosif Samuilovich Shklovsky, studying the secular acceleration of Phobos' orbital motion, suggested a "thin sheet metal" structure for Phobos, a suggestion which led to speculations on Phobos' artificial origin. Shklovsky based his analysis on estimates of the upper martian atmosphere's density, and deduced that for the weak braking effect to be able to account for the secular acceleration, Phobos had to be very light —one calculation yielded a hollow iron sphere 16 km across but less than 6 cm thick. 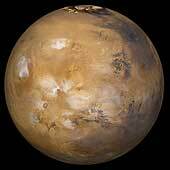 Competing explanations were based on the land tides Phobos could raise on Mars. The reality of the secular acceleration itself (corresponding to an altitude loss of about 5×10−12 per revolution, about 5 cm per year) was later subjected to doubt, and the problem vanished on its own by 1969. In a February 1960 letter to the journal Astronautics, however, Siegfried Frederick Singer, then science advisor to President Eisenhower, came out in support of Shklovsky's theory, going as far as stating that "[Phobos'] purpose would probably be to sweep up radiation in Mars' atmosphere, so that Martians could safely operate around their planet". A few years later, in 1963, Raymond H. Wilson Jr., Chief of Applied Mathematics at NASA, allegedly announced to the Institute of Aerospace Sciences that "Phobos might be a colossal base orbiting Mars", and that NASA itself was considering the possibility. Similar "hollow Moon" claims occurred at around the same time. In part 3 chapter 3 (the "Voyage to Laputa") of Jonathan Swift's famous satire Gulliver's Travels, a fictional work written in 1726, the astronomers of Laputa are described as having discovered two satellites of Mars orbiting at distances of 3 and 5 Martian diameters, respectively. The actual orbital distances of Phobos and Deimos are 1.4 and 3.5 Martian diameters, respectively. This is regarded as a fascinating coincidence; no telescope in Swift's day would have been even remotely powerful enough to discover these satellites. The first episode of the computer and video game Doom takes place in a UAC base on Phobos. Phobos as imaged by Mars Global Surveyor on June 1, 2003. Deimos (IPA /ˈdaɪməs/ or /ˈdiːməs/; Greek Δείμος: "Dread"), is the smaller and outermost of Mars’ two moons, named after Deimos from Greek Mythology. Phobos and Deimos were both discovered by American astronomer Asaph Hall. The names were suggested by Henry Madan (1838–1901), Science Master of Eton, from Book XV of the Iliad, where Ares (the Roman god Mars) summons Panic (Deimos) and Fear (Phobos). Deimos was discovered on August 12, 1877 at about 07:48 UTC (given in contemporary sources as "August 11 14:40" Washington mean time using the old astronomical convention of beginning a day at noon, so 12 hours must be added to get the actual local mean time). 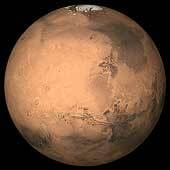 It has been designated Mars II. Deimos is composed of carbon-rich rock, much like C-type (carbonaceous chondrite) asteroids, and ice. It is cratered, but the surface is noticeably smoother than that of Phobos, caused by the partial filling of craters with regolith. The two largest craters, Swift and Voltaire, measure about 3 kilometres across. Because Deimos' orbit is relatively close to Mars and has only a very small inclination to Mars' equator, it cannot be seen from Martian latitudes greater than 82.7°.